Beech Mountain Ski Resort- 15 Slopes and Fun for the Whole family! The year was 1969 when I got the telephone call that would alter my life. “How would you and Jerry, Jr. like to take over the ski shop in the Beech Tree Village?”. It was the voice of my college roommate’s father, Mr. Jerry Leibhart; one of the original developers of Beech Mountain. At the time, I was a recently licensed, frustrated stock broker in Charlotte, who had spent most of my young life in retail. This was the opportunity to run a ski shop at the hottest new resort on the Eastern United States- how could I resist!? So that December, Jerry and I packed our bags and headed to Beech Mountain! We renamed the shop “The Fall Line”, Jerry and I thought we were hottest thing on the slopes! Being single, 20-something guys with the opportunity to sneak out to hop on the gondola to coast the slopes – what more could we ask for?! We had the times of our lives! Now, although I am out of the Ski Shop business, I am still in love with the slopes and elevations of Beech Mountain. Quite a bit has changed at the slopes, as it has become a year-round resort. But the Wintry season is where I feel the mountain is at its glory! 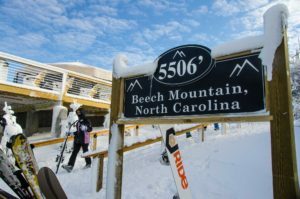 With 15 slopes and 8 lifts, Beech Mountain is packed with adventure for all skill levels and even includes a terrain park for all kinds of stunts! Focusing on being a family friendly resort, they also have an array of kid to adult friendly events that include movie, game, karaoke, and trivia nights. Who doesn’t want to play Star Wars Trivia? There are lessons for both Skiing and Snowboarding for all ages. Have little ones not old enough to hit the slopes? No reason you should miss out on the fun, Beech Mountain Ski Resort has a nursery! When you are ready to take a break from skiing, snowboard, or tubing- you can head over their Alpine Village ! 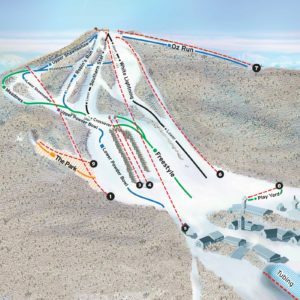 The village features off the mountain adventures such as ice skating, Beech Tree Bar and Grill, Ski Shoppe and the slope’s own Beech Mountain Brewery. Alan Kleinmaier is a new agent at Vincent Properties but has years of experience with High Country Real Estate and Development. DISCLAIMER! The views, thoughts, and opinions expressed in the text belong solely to the author, and not necessarily to the author’s employer, organization, committee or other group or individual.